As digital marketing budgets hit the record high values in decades, it is no wonder that everyone wants to take a bite off the profit pie at any price. This has led to the proliferation of consultancy firms, advertising advisors and self-appointed gurus who are all offering advice on the most efficient utilization of your ad space in terms of its monetization. In the tumult of conflicting information, publishers are sometimes prone to look for the solutions everywhere but in their own backyard, i.e. their ad space itself. Luckily for them, RevenueHits ad network has focused its efforts on optimizing the utilization of ad space as a solution to all monetization woes that have been plaguing publishers. Take five minutes to learn how RevenueHits can help you turn your ad space into a veritable money tree for your advertisements. First of all, RevenueHits ad network offers a CPA (Cost Per Action) model, which is attractive for all segments of the market that need to secure stable revenue sources. At the same time, it allows for monetization of your ad space by serving ads on your site by means of Geo-targeted ad serving technology. In addition to websites, you as a publisher are free to monetize toolbars, widgets and other assets, particularly if you take upon RevenueHits’ offer to use every inch of your ad space as efficiently as possible. To that effect, your ad space will not show ads that do not perform well, as RevenueHits uses advanced algorithms to research and examine the ways to place the ads with the goal of continually improving their performance. This means that RevenueHits will offer you an inventory comprised solely of high-performing ads that are relevant to your visitors, which helps with conversion rates and, consequently, revenue generation. Once you decide that you are ready to turn your ad space into gold, you can proceed with the installation of RevenueHits ads, which is both intuitive and essentially similar to what users have come to expect from a cutting edge online advertising platform. Following the placement of the post, RevenueHits ads can be installed in footer, header and sidebar sections. Exact locations are easily selected via the layout menu from the dashboard. Bear in mind that you can implement as many ads as you would like, with a caveat that having too many ads can degrade website performance. So, yes, RevenueHits is all about pushing the envelope of what can be achieved with ad placement. If you are wondering about being able to run ads on more than one site, RevenueHits does not preclude you from doing so, as you can use the same ad code on all of your different sites. At the same time, you have to bear in mind that doing this will make it harder for you to monitor each site’s performance. The best approach in this is to add another site to your dashboard and create a new ad code. In any case, you can start squeezing money out of your ad space by creating ad placements. The procedure is straightforward, and RevenueHits supports placement for both desktop and mobile platforms. After the placement, you simply pick the desired ad type, such as the banner ad or the footer ad, followed by ad size you deem most suitable for your needs. If you’ve selected a banner ad, for example, you will see a drop-down menu with different sizes to choose from. Also, you can see how the placement will look in the preview options. Once you provide the description and fill in the names of the website on which the ad is to be served or displayed, you have actually made the first step on your path to web monetization. This is followed by copying the implementation code and placing it in the backend of your website. The preview feature allows you to see how the ad looks on your website and if it requires modifications according to your requirements. You can also easily track and analyze the performance of your ad in the website, i.e whether it will generate any income or not. You can keep an eye on the impressions, eCPM, clicks and revenue per customer time. All of your monitored stats are colored differently for easy assessment. You can analyze the performances of each ad on your ad space and introduce changes in case you find it to be appropriate. 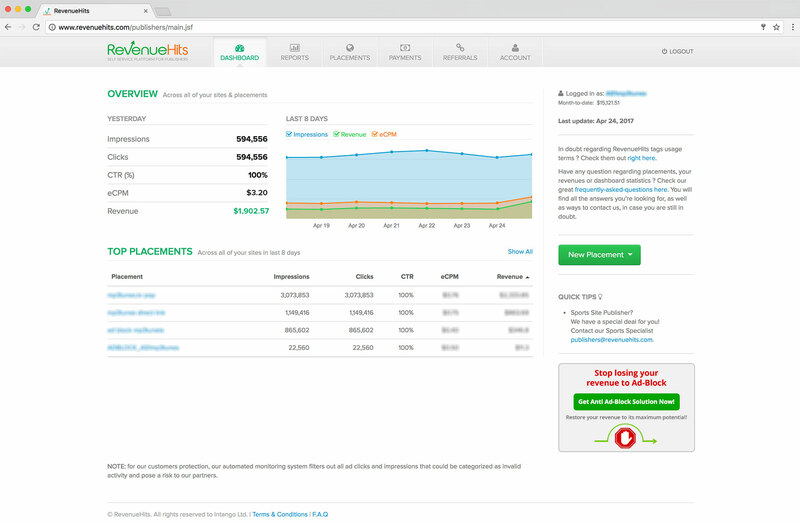 For this purpose, RevenueHits offers you a user-friendly dashboard that gives you a bird’s eye view of all of your website ads and their performance, such as that relating to impressions, clicks, CPM rates, CTR, eCPM and revenue generated for a specific ad. By giving you this transparent level of control, RevenueHits guarantees that not an inch of your ad space will be wasted on ads that do not perform well. Finally, RevenueHits allows you to utilize your ad space more flexibly by offering you a wide selection of banners with different sizes, pops, shadow boxes, interstitials, buttons, top bars and mobile placements. RevenueHits currently offers the following types of ads: display banner, button, footer, interstitial, pop ad, shadow box, slider top banner and dialog and notifier ad types. Simultaneously, RevenueHits utilizes technology that makes it possible to scan and review the performance of millions of ads online. Going for useful heatmaps tools to track the response your ads are getting from your visitors, as well as the effect these ads have on the user experience is also a welcome approach. Yet, the final decision on their selection rests solely with you. As the generated income is dependent on ad performance, you are also free to select from any of these ad types. Once you make the decision on the advertisement type you prefer, you can share that information with the company to secure placement of the most relevant ads on your web property. Prior to that, the most sensible approach is to engage in analyzing the crowd that frequents your website and picking an ad type that will be best aligned with their overall user experience. Monetization of your web property starts with the optimal utilization of your ad space. RevenueHits professionals believe that you should not walk this path alone and want to help you avoid wasting your ad space on less efficient ad types or formats. Picking the right partner in the process of cultivating your ad space is a key decision in terms of securing the most fortunate financial outcomes. This can also make a difference between experiencing faster or slower generation of income for you and your web property. While the final decision ultimately rests with you, be aware that RevenueHits can easily become your best new ally on the path to successful and lucrative closure of your web monetization efforts.